Gen. David Petraeus spoke with students at Georgetown Law School. Washington (CNN) -- The visits came with the trappings of the season's hottest rock 'n' roll tour. The star (four of them, really) and his posse roll in a pair of brand new GMC Yukon XL SUVs. There is security everywhere and a corporate sponsor. You could even say he has his groupies and critics. There are no satin tour jackets or opening acts, but that's about all that separates this week's travels by Gen. David Petraeus, head of U.S. Central Command, from a tour by John Mayer or Lady Gaga. Petraeus, perhaps the best known active duty officer in the U.S. military, has been on a stateside public appearance blitz this week. He held three events in Georgia on Wednesday, including an "off the record" editorial board meeting with CNN. He also taped an interview with CNN anchor Kyra Phillips. On Thursday he held three more events in Washington. At each stop he is selling his message about Afghanistan, Iraq and Yemen. CNN was there for all three of his Thursday stops in Washington, hearing him tell the one joke over and over (it's about Wolf Blitzer and the real situation room) as well as fresh jokes aimed at each particular audience (the one about the law students in the bar got some good laughs). Why so many events in row? "It's called strategic engagement," one of his aides said. "He's getting the message out" about the importance of holding onto the gains made in Iraq, sticking with the fight in Afghanistan and keeping an eye on Yemen. In spite of some Internet speculation, he and his aide made clear that Petraeus is not running for president. Petraeus even confirmed that he hasn't even cast a vote in an election since he became a two-star general in 2003. At all three Washington stops, his aides were prepared for a PowerPoint presentation. Petraeus has been known to deliver hour-long PowerPoint talks that have literally put some journalists to sleep. But on Thursday he (thankfully) waived what he called his "Constitutional right" as a four-star general to use PowerPoint slides to illustrate his remarks. In fact, only once did he use them, and that was to illustrate the extreme complexity of counterinsurgency operations to students at Georgetown University Law School. The rest of the time at the law school, later at Georgetown's main campus and earlier Thursday at the Center for Strategic and International Studies, he focused on answering questions from the audience. About Iraq he said, "in the three years since the surge was launched, levels of violence down by well over 90 percent now, violent civilian deaths down by well over 90 percent, high-profile attacks down by over 90 percent and all the rest." But Petraeus noted that "innumerable challenges" remain, including a growing problem over reconciliation among some Sunni and Shi'a leaders. He fielded numerous questions about Afghanistan, including one about the difficulty of fighting a war in one of the poorest countries in the world. "There's quite a building boom going on," Petraeus said. "Some wag the other day... assessed that this is the largest building boom in Afghanistan since Alexander [The Great] built Kandahar. And I think that may be accurate. There is a huge amount of construction to develop additional airfields, additional ramp space, additional forward operating bases, combat outposts and all the rest of that." All the building will be to accommodate the tens of thousands of new U.S. and NATO troops now headed to that country. He also tackled a question about a new controversy just making headlines, the news about a company that makes rifle sights for use by the U.S. Army and Marine Corps. The company has been inscribing Bible references onto its scopes. Petraeus called the inscriptions "disturbing" and said they were counter-productive. "It conveys a perception that is absolutely contrary to what it is that we have sought to do. I mean, there's a reason that we put people through cultural awareness training," Petraeus said. The company later announced it would stop the practice. Several questions related to recent concerns about the growing al Qaeda threat in Yemen, especially after it was revealed that a man suspected of trying to blow up a Detroit, Michigan-bound airliner on Christmas Day had been trained there. "This is not something that is a total surprise to us at all. I've noted that Yemen was very much in my sights as much as two years ago," Petraeus said. His posse (or in Washington-speak his cadre of aides) is comprised of officers from various branches of the armed forces, civilian assistants and plain clothes security. The corporate sponsor, at least for the CSIS stop, was, Rolls-Royce. Not the luxury car maker, the former subsidiary with the same name that makes military plane engines, among other things. Several of his groupies, well you could call us the Pentagon press corps, showed up for at least one of the day's events. The critics came at Petraeus's last event on Thursday, a speech at Georgetown University's main campus, where he once did a fellowship. Just as he was beginning his remarks, a young man, apparently a student, stood up and shouted about the dead civilians killed by the war in Afghanistan. Petraeus stood by silently as the young man who began reading the names of dead Afghan civilians, was warned to stop and then led away. As Petraeus resumed speaking, another protestor began loudly reading more names of the dead. This time Petraeus calmly said "I hope that there is equal attention given to the casualties caused by the Taliban." The general later pointed out that he and the rest of the military fight to defend the right of Americans to exercise their freedom of speech. All told the early part of the event was stopped six times by protestors angry about the war and about Georgetown University, which was founded by Jesuit priests of the Roman Catholic Church, inviting Petraeus. At one point, a large number of people in the audience of about 700 tried to drown out the protestors by chanting "USA! USA!" Petraeus seemed unfazed by the protests. The demonstrators, about 10 in all, were led out by university police without the need of force or handcuffs. After a stern warning from a university official, the protestors inside the hall were quiet. Petraeus even finished telling a joke, pointing out that he believes one should not "take yourself too seriously" even while taking your duties seriously. It was a constant if unspoken theme during his swing through Washington on Thursday. Petraeus can poke a little fun at himself and those close to him, but when he's asked about his mission as leader of the most important combatant command in the U.S. armed forces, he's all business. 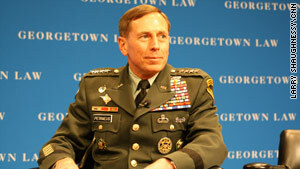 On Friday, the Petraeus World Tour 2010 resumes at the Institute for the Study of War in Washington. He'll return to his duties as commander of Central Command for a while, but on March 1, the posse rolls again when he speaks to students of Vanderbilt University in Tennessee. Maybe by then he'll have some new jokes.